WOOSTER, Ohio — Scientists at The Ohio State University have successfully tested a new chemical to control mosquitoes, including the ones that spread Zika, and it comes from a traditional medicinal plant found only in Madagascar. Peter Piermarini and Liva Rakotondraibe said a bark extract from Cinnamosma fragrans, a small tree commonly called mandravasarotra, made the mosquitoes in their study buzz off. It repelled the flying adults from a distance, which kept them from landing and feeding on blood. And it killed the larvae and adults upon contact. In recent years, public health agencies have been scrambling for new ways to fight the biters. That’s partly because more and more mosquitoes have become resistant to common insecticides, and partly because of the spread of mosquito-borne diseases, Zika being one of them. The U.S. Centers for Disease Control and Prevention reported in May that illnesses from infected mosquito, tick and flea bites tripled in the United States during the 13 years from 2004 to 2016, with more than 640,000 total cases reported. The Ohio State scientists said the new chemical isn’t ready to be turned into a commercial product just yet, but has lots of potential to become one. Of note, they said the chemical works equally well on normal mosquitoes and on mosquitoes that are resistant to common insecticides. So as an added weapon in a mosquito-fighting arsenal, it could slow the development of resistance to other insecticides. “It appears to act through a novel mechanism that conventional insecticides currently don’t exploit,” Piermarini said. Mandravasarotra is one of the more than 12,000 plant species found in Madagascar, of which 8 out of 10 are endemic: they don’t grow naturally anywhere else. Parts of the tree have long been used in folk medicine in the country, and more recently, as a source of essential oil for aromatherapy. Piermarini is an expert on the biology of mosquitoes. Based at CFAES’s Wooster campus, his work includes developing new insecticides and repellents. Rakotondraibe is an assistant professor in Ohio State’s College of Pharmacy in Columbus, where he focuses on medicinal chemistry and pharmacognosy (the study of medicines from natural sources). Originally from Madagascar, Rakotondraibe has a special interest in the country’s diverse medicinal plants, mandravasarotra included, and when he came to Ohio State in 2013, he brought with him some of the compounds that he had isolated from those plants. He’s testing the compounds for treating diseases including malaria and cancer. A mutual colleague, who knew of Piermarini’s and Rakotondraibe’s research interests, suggested the two team up. For their study, the scientists tested the mandravasarotra bark extract on Aedes aegypti, one of the most widespread mosquito species globally and the primary carrier of the Zika, dengue, yellow fever and chikungunya viruses. All four viruses are spreading in the United States and in other parts of the world, possibly due to climate change, and can cause serious diseases in humans. Through their research, the scientists found that mandravasarotra bark contains a chemical called cinnamodial, and that’s what affected the mosquitoes. Cinnamodial is a sesquiterpene, a group of plant chemicals common in resins and in essential oils. The scientists further discovered that cinnamodial activates a type of sensory receptor in the mosquito called TRPA1. 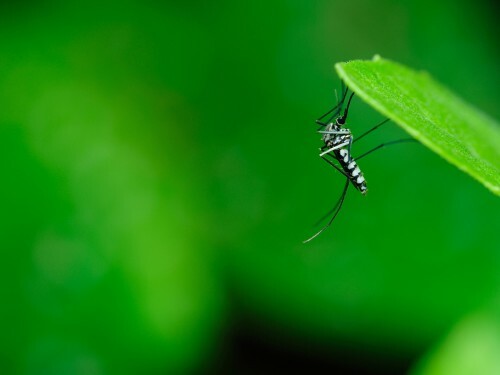 Located in nerve cells on the antennae and mouth parts, TRPA1 receptors help mosquitoes detect heat and dangerous chemicals in their environments — things that could damage their genes or their bodies, things they should try to avoid. Piermarini said cinnamodial is “probably quite irritating to the mosquito,” which is likely why it’s repellent. He said a similar receptor in humans detects spicy foods. It’s less clear, though, why mosquitoes die from cinnamodial, at least after having direct contact with it. Piermarini said his best guess is that it’s due to an aldehyde, one of the molecules that make up the compound. “Aldehydes tend to be fairly noxious chemicals that can cause a lot of damage to cells and DNA,” Piermarini said. He thinks the compound does exactly that, to the point it kills the mosquito. In some of their tests, the scientists sprayed the bark extract on adult mosquitoes. In other tests, they added it to the water of the swimming larvae. But it was good news for the scientists. Next, Rakotondraibe will begin to try to improve the compound, tweaking it at a molecular level to make it more stable and potent. He’ll try to isolate other new chemicals from mandravasarotra bark, too, and if he succeeds, Piermarini will test them in a similar fashion to see their effects on mosquitoes. Together, the scientists will simply try to better understand what the chemicals do to mosquitoes: What makes them toxic and repellent? “Ultimately, if you want to control mosquitoes, you need to have a really comprehensive toolbox,” Piermarini said. “You don’t want to be limited to just one tool, because they’re going to be evolving resistance to it. The study appeared in the journal PLOS Neglected Tropical Diseases. Researchers on the study also included Edna Alfaro Inocente, Marguerite Shaya and Nuris Acosta, all of CFAES’s Department of Entomology. The study was funded by the National Institute of Allergy and Infectious Diseases, part of the National Institutes of Health; Ohio State’s Public Health Preparedness for Infectious Diseases Program; the SEEDS competitive grants program of CFAES’s Ohio Agricultural Research and Development Center (OARDC); and state and federal funds appropriated to OARDC.